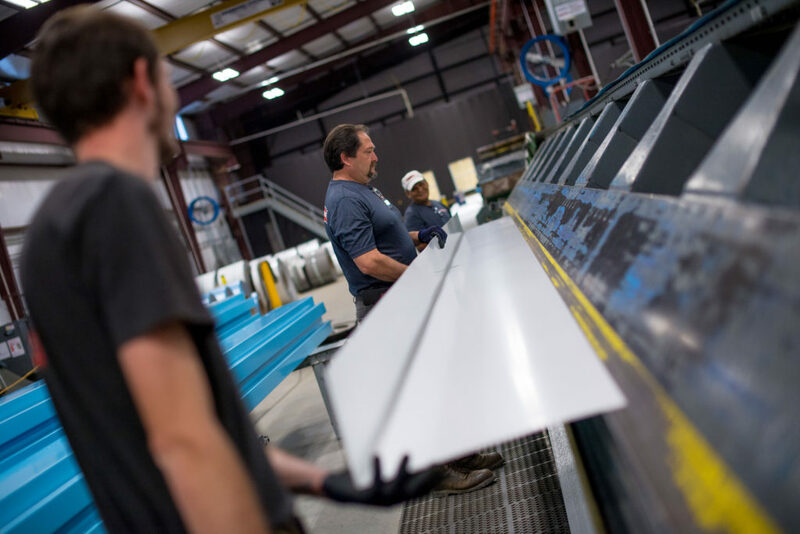 MetalWorks has two (2) 40′ Long Folders. A 16 Gauge Bradbury Folder with Slitter for fabricating a wide range of custom shapes and a 40’ Long x 14 Gauge Jorns Folder with slitter or heavier gauge shapes. MetalWorks stock coil sizes are 23.75″ and 48″. We have pre-painted galvanized and/or galvalume steel in 20G, 22G, 24G and .040 Aluminum in Gloss White and Dark Bronze. We can form your shape from one of these sizes or cut the width down with our slitters to fit your requirements up to 40′ long. The computerized controls on the folders allow us to have virtually no setup time, we can change degrees of each bend, hem the edges or not and save your requirements for the next time. This allows us to make quick small runs without additional costs. Some of the wide range of shapes are Perimeter Type Gutters, Tapered Type Gutters and/or Panels, Special Size Panels, Hat Channels, Cee and Zee Channels and Angles. Most likely we can make about any shape you need. All pre-painted parts are protected with a light tac plastic and all items are package using our heavy duty packaging methods. Gutter end connection options are Straight runs (usually jointed with an inside splice), Interlocking where one end slides into the other with a snug fit (usually a 3″ to 4″ lap) or Notched & Offset where one end will slip inside the other (2″ lap) and fit flush since the 2″ end is offset by a metal thickness. 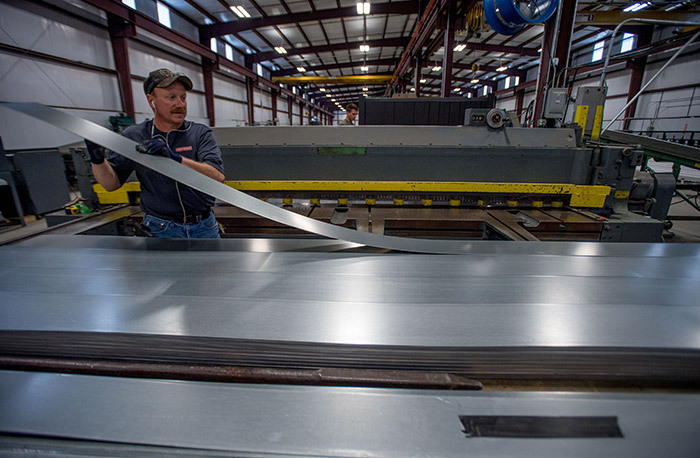 MetalWorks can cut you Flat Sheets (4’ x 10’, 4’ x 12’, etc.) off our Sheet Line. This line is also setup with in-line slitting and allows us to cut you variable widths x length – like 24” wide, 16″ wide, x 12’, etc. We stock Master Coils (48” Wide) in 20G White or Bronze, 24G White and 040 White – all in Smooth or Embossed.